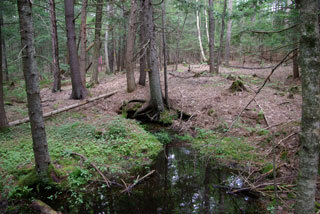 This short woodland loop has many impressive pine trees and passes Shepard Spring, the source of Chandler Brook. 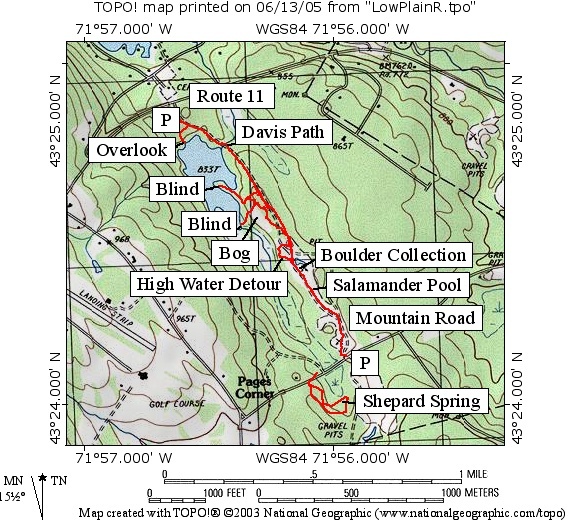 The half mile loop trail to Shepard Spring is shown across Mountain Road from the Davis Path on the Low Plains map below. Parking is available along Mountain Road. All trails in the Esther Currier Wildlife Management Area, known as Low Plain Trails may be accessed from the parking area (P) off Route 11 or from a parking area (P) on Mountain Road. A brochure with Low Plains Trails map is available here and at the Route 11 entrance. The main trail is named the Davis Path. It is a gated gravel road that runs between Route 11 and Mountain Road. Side trails go to an overlook and to observation blinds along the edge of Beaver Pond. A quaking bog may be viewed from a boardwalk on the trail to the Marsh Point blind (not passable at high water). A high water detour is also available for the Davis Path. A geological exhibit (boulder collection) and a salamander pool are visible from the Davis Path. The Davis Path is 1.1 miles in length (one way). - See Map Below or Return to Main Trails Page. 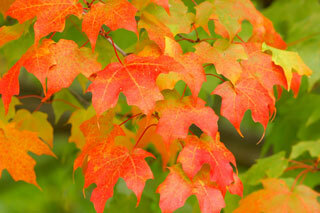 Copyright © 2013 New London Conservation Commission - All Rights Reserved.